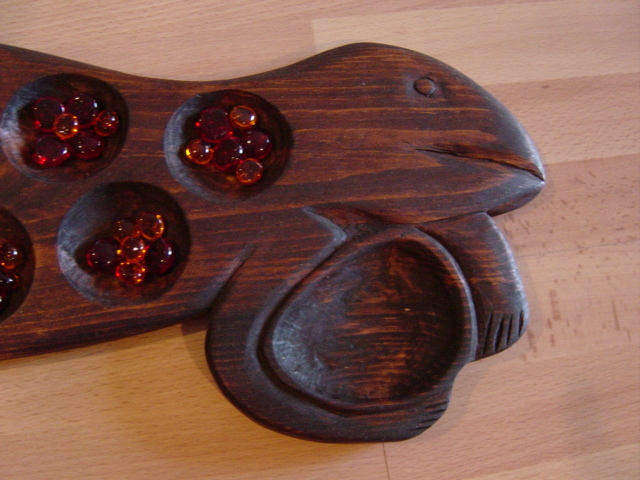 We were in the Philippines when we first spotted a lizard mancala board in a traditional open air market. However, when we inquired about the price, we felt it was out of our budget. When I got back to Korea, I couldn’t get the board out of my mind, and so I decided to design my own lizard board. Once I came up with a drawing, I handed it over to my husband, and since I’m married to a carpenter (lucky me! ), he was able to render the design with ease. I stained the board a deep brown and added some pretty orange and red marbles to complete the set. Voila! Any one want to play a round?